Hastings-on-Hudson | Will You Miss Me When I'm Gone? 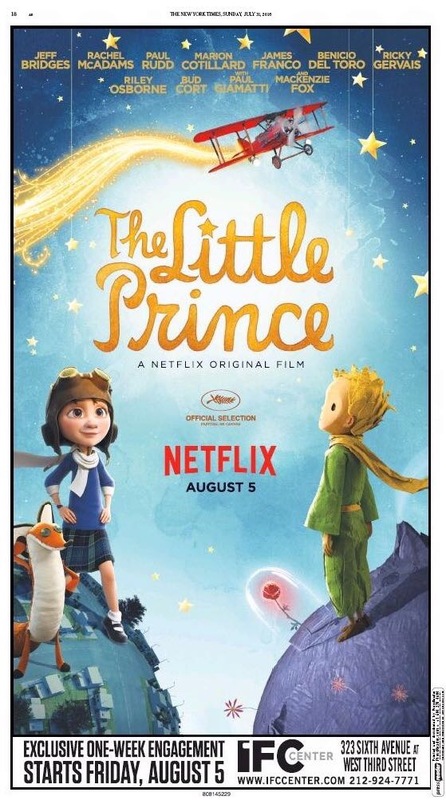 It had to be at least a little demoralizing for Mark Osborne, the veteran “Kung Fu Panda” director from Hastings-on-Hudson, to see his lyrical take on classic children’s book “The Little Prince” get pulled from the Paramount Pictures release schedule just a week before its U.S. premiere this spring. After all, it was a film he felt “destined” to make, he told me in an interview for The Journal News/lohud, because he was introduced to Antoine de Saint-Exupéry’s beloved 1943 illustrated novella by the woman who is now his wife. He did get a chance to see it on the big screen in special one-off sneak preview at the Jacob Burns Film Center in Pleasantville just days before Paramount pulled the plug. Although, Netflix stepped in and picked up the film almost immediately, it appeared that the lovely film would be for streaming only, and not generally available in a theater. While streaming is probably the method many families would prefer to use to watch the family flick, there’s something sad about the idea that Osborne’s gorgeous creation would not be available on a bigger screen as a communal moviegoing experience. Luckily for film buffs of all ages, the “Netflix Exclusive” is scheduled for a theatrical run that begins Friday, the same day it’s available for streaming. The IFC Center in Manhattan’s West Village has the exclusive, which was announced in a splashy full-page ad in Sunday’s New York Times. For a real treat, see this one in the theater. The IFC Center is at 323 Sixth Ave. (at Third Street) in Manhattan. Go here for showtimes and tickets. NEW: You’ll also have one chance to see the movie on a big screen without making the trip into Manhattan. There’s a special screening with the director at 6:30 p.m. Sunday Aug. 7 at Alamo Drafthouse, 2548 Central Park Avenue in Yonkers. GO HERE to buy tickets at $13.25.